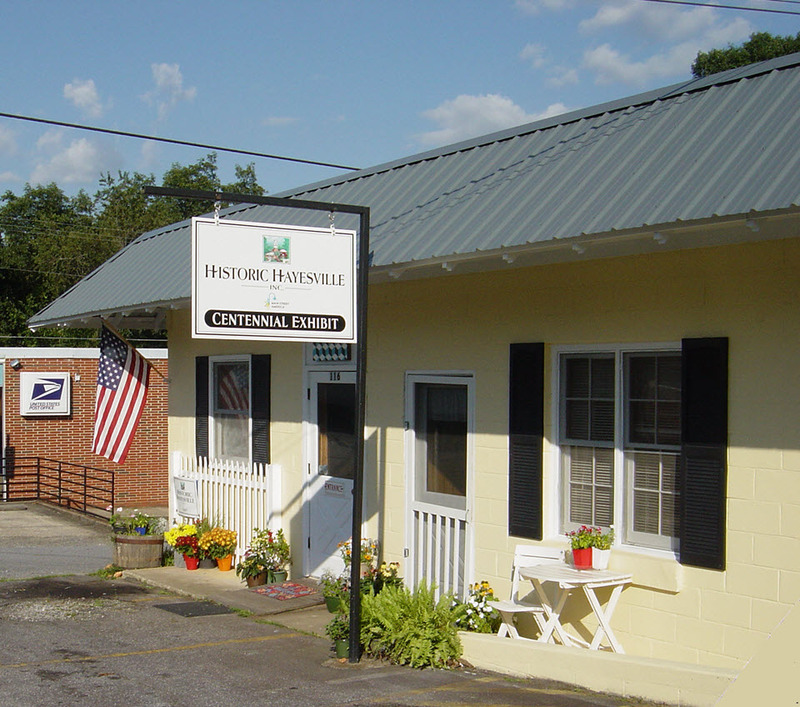 Hayesville was designated as a NC Small Town Main Street community in 2013 to participate in an orientation and guidance program for two years under the National Main Street Center's Four Point Approach™ which includes organization, promotion, design and economic vitality to implement downtown projects. Volunteers representing at least ten community organizations participated to become eligible for grants related to the downtown area. Designation in the program is renewed annually and Hayesville was approved in 2016 as a Main Street America Affiliate with ties to the National Trust for Historical Preservation. Historic Hayesville Inc. was formed in 2016 as the required 501c3 nonprofit and administrator of Hayesville's Small Town Main Street program with additional opportunities to apply for grants. One of those opportunities included application to the Main Street Solutions Fund which was approved for $200,000 to assist with bringing a new restaurant to downtown Hayesville. Volunteers are now in their sixth year working under the Four Point Approach™ and new status to secure funds under Small Town Main Street/HHI to benefit downtown projects. • ORGANIZATION strategy is to build human and financial resources through local government, businesses, community groups and individual partnerships to achieve significant downtown improvements. • PROMOTION committee members are working to create and sell a positive image of downtown based on unique assets such as the historic square with surrounding retail shops combined with cultural attractions including art, music, recreational trails and events that exemplify a center of activities. • DESIGN plans include improving physical aspects of downtown with new facades, pedestrian connectivity and positive impacts for public spaces. • ECONOMIC VITALITY group works with the other 3 action committees to expand and diversify the downtown base to bring new life to downtown Hayesville. Small Town Main Street/HHI has a Board of Directors comprised of six members working with the Mayor of Hayesville to facilitate the work plan and continued participation in the Small Town Main Street Program. Community involvement is encouraged through partner organizations and individuals with similar goals for downtown improvements. Meetings are scheduled on the 4th Tuesday of every month at 6:30pm in Town Hall unless otherwise publicized. Contact us for more information. Hayesville is one of the smallest of towns affiliated with the national Main Street America program. With its roots in the National Trust for Historical Preservation, Main Street America is a program conceived to help revitalize older and historic commercial districts while protecting the character of cities and towns across the country. "We believe that everyone deserves access to a vibrant neighborhood -- a place that has a thriving economy, is rich in character and features inviting public spaces that make residents and visitors feel that they belong. Working together, the Main Street America network helps to breathe new life into the places people call home." 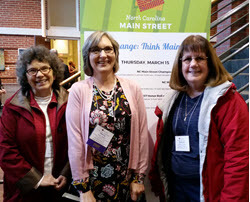 Deborah Nichols and Sandy Zimmerman joined Sherry Adams from the NC Dept. of Commerce to discuss progress in the Hayesville Small Town Main Street program. Mayor Harry Braughn caught up with Gov. 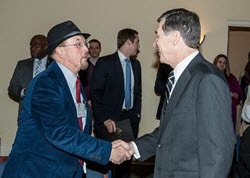 Roy Cooper after the governor spoke to Main Street Conference attendees. VISION: Beautiful Downtown Hayesville, with its historic courthouse square, is the hub for history, culture, economic activity, recreation, arts and education, serving as a beacon to attract tourists while engaging residents and providing a safe haven for all. MISSION: Historic Hayesville, Inc., in administering the Small Town Main Street program, has a mission to preserve, protect and promote the town square, fostering economic activity, facilitating opportunities for existing and future residents. Friends of Historic Hayesville maintain the HHI Centennial Exhibit and Small Town Headquarters located at 116 Sanderson Street. Volunteers represent partner organizations and work together to promote fundraising events for downtown projects. Contributions are greatly appreciated and may qualify for tax deductions. Historic Hayesville, Inc. is a NC 501(c)(3) non-profit community based organization and administrator of Hayesville's Small Town Main Street program managed by volunteers. We hope you will return soon for project and event updates.